Capturing Wireless on Windows was always problematic, because other than on Linux or Mac it wasn’t possible to activate Monitor mode on the WiFi cards to capture the radio layer. All you could do was capture packets on your WiFi card from the Ethernet layer and up. That’s unless you spent money on the now discontinued AirPCAP USB adapters. But now there is a silver lining on the horizon in the form of the npcap library. A WiFi card that supports monitor mode. The npcap capture libraries (instead of WinPCAP). Unfortunately, not all WiFi cards support monitor mode on Windows. There’s a matrix available that you can use to check if your card is supported: https://secwiki.org/w/Npcap/WiFi_adapters. I use either Alfa cards or, in this case, a NetGear A6210, which I bought at a local electronics store. If you run Wireshark, you’ll notice that you have a “Monitor Mode” checkbox in the capture interface dialog for your WiFi cards. You can open that dialog from the main menu via “Capture” -> “Options” or by pressing CTRL-K. Unfortunately, even with npcap installed correctly it doesn’t seem to work if you click it (at least in my case), because the check mark disappears again after a short moment. I’m not sure if that’s normal, but as far as I found out Wireshark can’t modify that setting because it doesn’t have the sufficient privileges to do that. You can either run Wireshark in administrative mode – which I strongly advise against, because it could allow malicious packets to compromise your system. Check out this blog post about “Attacking Wireshark” for details. Click “Run as Administrator” or (if you want to impress people standing behind you) press CTRL & Shift & Enter to launch the icon in administrative mode. We get a ton of management frames, and we also see the typical “Radiotap Header” that tells us about the radio layer. Exactly what we wanted. 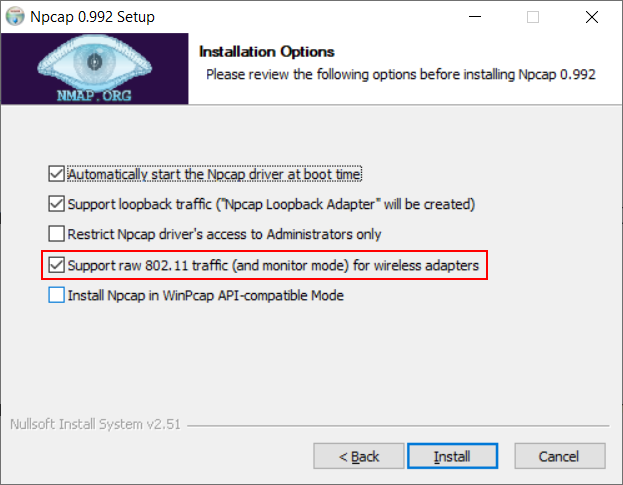 Capturing Wireless on Windows got a lot easier now, and with npcap it’s also possible to capture on more recent cards than the old WinPCAP adapters which stopped at the 802.11n technology as far as I know. One thing to keep in mind: capturing in monitor mode means that the card becomes a “receive-only” card. So don’t be surprised when you lose connectivity if you have only one WiFi card in your system. If you need to stay connected to a wireless network while capturing it you need two cards – one in managed mode, one in monitor mode. What was your experience with attempting to restore the WiFi adapter back to “managed” mode once “monitor” mode capturing was done? For me, attempting to use the WlanHelper .exe tool to do this didn’t work. Instead, I had to go to the Control Panel -> Network and Sharing Center -> Change Adapter Settings -> and then Right-Click Disable the WiFi interface and Right-Click Enable it again in order to restore it back to a usable state. My adapter is the Intel(R) Dual Band Wireless-AC 8260 that comes with the Dell Precision 5510 laptop. For my Netgear adapter it was no problem at all. I just tested it again to be sure – the only thing that happens is that Wireshark (if still running) is unhappy for obvious reasons, but I could connect to the WiFi in managed mode without problems. It’s probably one of those things that depend on the chipset. Hi, Nice post. I can see the frequency (channel) is not visible in wireshark. When you sniffer with multiple adapters its nice to know if they are all working correct. Any idea why the frequency is set to 0? No, it’s something I realized, too – it should not be zero as far as I can tell; I guess it’s something that needs to be fixed in the future. Good job! I also could set WiFi adapter RTL8187B from Realtek (in my old laptop with WS7) in “monitor mode” by “Wlanhelper” with only one driver’s version – 6.1159.323.2009. Thanks, Yaroslav, that’s good to know! But unfortunately, in the main window, these channels not show. And may add a column with RSSI info.